Belt Buckle w/Optional Gold, "Snowy Owl"
This trophy-style belt buckle design is an older one that Neil is anxious to find the time to make. He would "modernize" and tighten up the scrolls to what he's doing now. He would do the owl in white gold or in sterling silver to set it off from the yellow gold background. On the rare occasions when the snowy owl is seen, it appears like a ghost out of the dark, and he thinks this would capture that. The elaborate scroll-work edges would be in sterling silver. The oblivious mouse in the scrolls on the right side could remain camouflaged in sterling silver, or it could be made to stand out a bit by using different materials. Neil would probably also add some berries into the scrolls for fun. 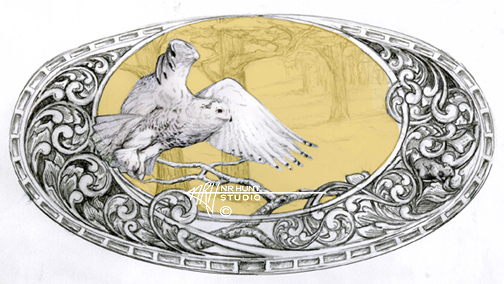 Pricing for Hand Engraved Trophy-Style Belt Buckle, "Snowy Owl"